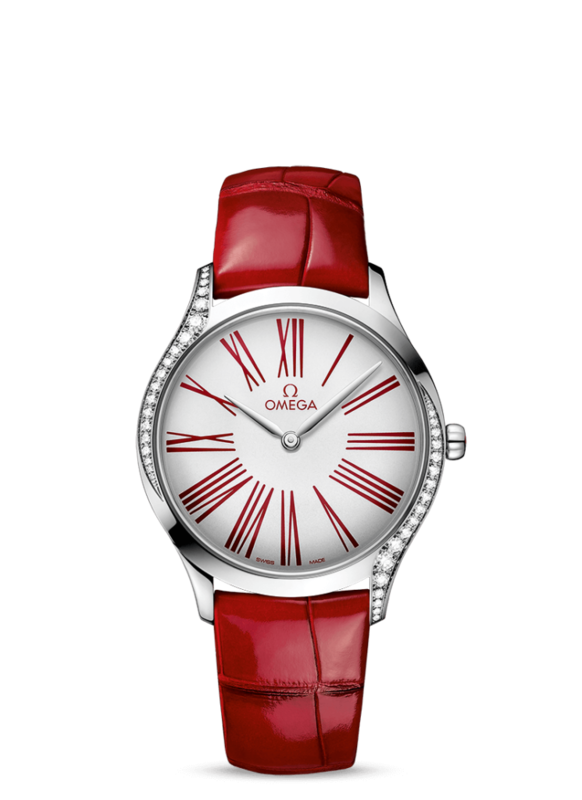 We all need a little color in our lives, and the new Omega Tresor certainly delivers with this exclusive quartz watch for women all in red. This edition has been attracting many eye balls.. In the contemporary Trésor collection, each watch has been crafted with a pure design aesthetic and a truly modern edge. 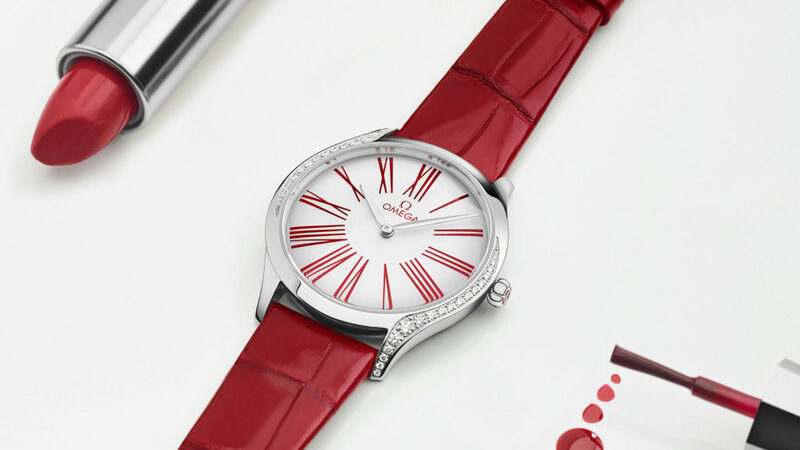 For this model, the slim 36 mm case is crafted in stainless steel and features 38 single-cut diamonds, which curve around the OMEGA Calibre 4061, which sits just behind a polished mirror caseback that is embellished by a metalized “Her Time” pattern, with a “Long Life” feature to maximize the autonomy of the battery. 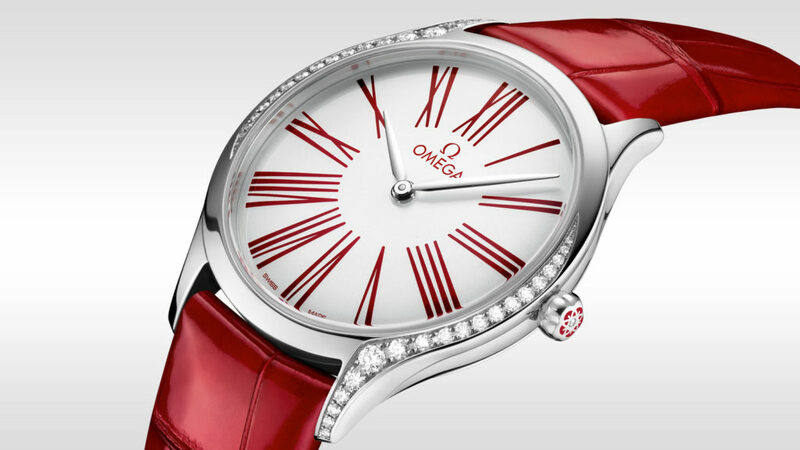 The chic look and feel is complete with the exclusive red Omega logo with rhodium plated parts and circular graining. The lacquered white dial is surrounded by transferred Roman numerals in red, while the crown includes a single diamond, this time surrounded by a red ceramic flower made from five OMEGA logos with a red leather strap. The intelligent use of domed scratch-resistant sapphire crystal with anti-reflective treatment on both sides ensures longevity and stress free use of the timepiece for that romantic evening or for that matter, through hectic work days. Red is hot and make this your bold choice of timepiece. Flaunt it and make a statement. Previous articleFendi’s Baguette-Its All About the Bag!